Adrian "Moro" Opaque Tights with support, no fly - NEW! Practical, durable, warm second skin for your legs - Moro is a very classy looking camo style, that can serve both as practical underwear or base layer during fishing trips, excursions and other outdoor activities; or as a sports or fashion garment worn with short trousers. It's semi-thick (using 60 den yarn), which means it follows your leg contour precisely, without forming the disturbing wrinkles we all know from traditional thermal underwear. When you don't wear these tights, their size will be reduced to a minimum, allowing more space for other items in your bag or backpack. The material is just enough opaque that you don't need to worry about your leg hair if you decide to wear the Moro visibly. The pattern is not printed, but knitted into the fabric (you'll see it if you turn them inside out), resulting in more strength (but still single thickness), which translates into support, which is good news for all guys who are active. The manufacturing quality is very high, with only flat seams. No fly opening or reinforced toes, but comes with a comfortable male panel. Colors: One color, black (Nero). The Great and comfortable and that is why gave them five stars. Out of the package, these tights looked awesome and I liked the color combination of these Adrian Moro tights. They fit wonderfully and there was no sagging on the legs and the compression is good. I was able to wear all day long under shorts without problems. These are a great look and a great fit! Awesome for working out under shorts. Doing business with GLS has been a pleasure!! I wore these for the first time yesterday, Love the color and look of the pattern. They were a little harder to get on/off than the last pair I purchased. However, I would recommend them. 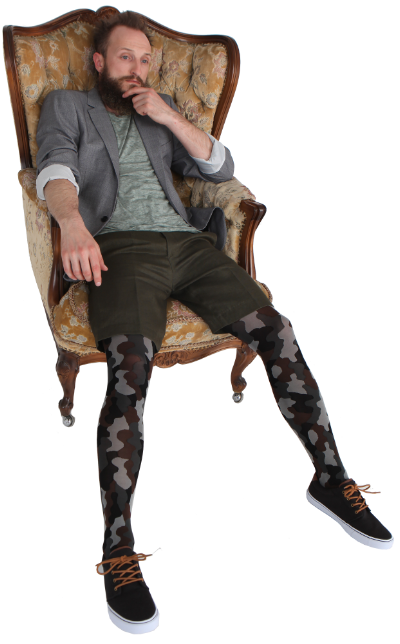 Click the button below to add the Adrian Moro support fashion tights for men to your wish list.